It might sound a little bit like the name of a character from Star Wars, but C3R is actually a procedure that is commonly used as a keratoconus treatment. It is something that Advanced Vision Care is pleased to be able to offer suitable patients, and it has the potential slow or even stop the progression of keratoconus. Let’s take a look at some top facts about C3R. C3R stands for corneal collagen crosslinking with riboflavin. As mentioned above, C3R is a keratoconus treatment. 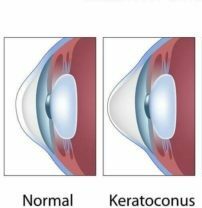 Keratoconus is a fairly rare condition of the eye where the cornea becomes stretched and begins to form something of a bulge or cone shape where it should usually be round. The image below shows a normal cornea compared to that of someone who has Keratoconus. You can read more about what keratoconus is and some of the other conditions linked to it on the relevant page of our website. C3R is not the only treatment available for keratoconus, so you might find that if you come to us for treatment, your AVC surgeon recommends something different or that you combine C3R with another treatment as well. It’s important that patients are aware that C3R is a treatment not a cure. This means that you are likely to continue to need to wear glasses following your treatment, although the treatment should prevent your keratoconus from getting worse. When C3R is used as a keratoconus treatment, riboflavin eye drops are absorbed by the cornea before a special light is used on the eye in order to create more robust chemical bonds. One of the ways in which C3R helps to slow or halt keratoconus is by enhancing the links between your cornea’s collagen protein strands. This has the effect of making the cornea more rigid, which helps to slow the progression of the condition. Most patients with keratoconus should be suitable for treatment with C3R. There are a couple of exceptions to this. For example, if your keratoconus is particularly advanced then you might not be suitable to have the treatment, but your AVC consultant will discuss the alternative options with you. However, the majority of patients with progressive keratoconus should be fine to have the treatment. For more information on keratoconus or how C3R can be used to treat it, please feel free to visit the relevant Collagen Cross-Linking pages on our website here or get in touch to book a consultation with one of our highly qualified surgeons.